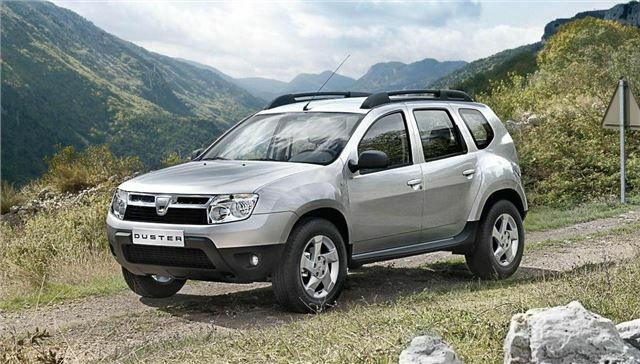 Romanian brand Dacia is to introduce its new Duster crossover SUV in January 2013, priced from an incredibly low £8995. Orders are open from late June 2012, and thanks to Renault being Dacia’s parent company there’s already an established dealer network – 127 Dacia dealers will have left-hand drive models on display from June 28 so potential buyers can familiarise themselves with the new car. The Duster will be available in both two- and four-wheel drive forms, the latter priced from £10,9995. A 1.6-litre 105PS petrol and a 1.5-litre 110PS diesel will be available, but only entry level models will be offered with the petrol engine. The petrol engine has fuel economy of 39.8mpg in 2WD form and 35.5 in 4WD form, with emissions of 165g/km and 185g/km, respectively. The 1.5-litre diesel, which is expected to be the more popular engine, manages a combined cycle figure of 56.5mpg in 2WD form and 53.3mpg in the 4WD, with emissions of 130g/km and 137g/km, respectively. Diesel engines are mated to a six-speed manual gearbox while petrol models make do with a five-speed transmission. There are three trim levels – Access, Ambiente and Laureate. Costs are kept low by making things simple, so the entry level model is equipped with the essentials and little more. There are roof bars, electric front windows and remote central locking, but there is no radio. Wiring to install your own aftermarket unit is provided, though. The mid-spec Ambiance model gets a radio, Bluetooth, aux and USB-in and steering wheel mounted audio controls. There’s also colour coded bodywork and a 60/40 split rear seat for improved practicality. Moving up to the top spec ‘Laureate’ model, priced from a still inexpensive £12,995, gets buyers 16-inch alloy wheels, air conditioning, electric rear windows and improved interior materials. The options list is short and sweet, with just traction control, metallic paint and a few styling packs to add a bit of flair to the Duster’s looks while also improving practicality. Pre-orders are open now, with first deliveries of right-hand drive models expected in January 2013. As our roads detiorarate under austerity and complex electronic bling sends cars to the scrapyard long before their galvanised bodies look old, this back to basics philosophy has to appeal to those of us not on a Top Gear presenters salary and perks. Bought in petrol format to keep things (relatively) simple I think the Duster makes a sensible purchase. Proper no frills transport really appeals - even if I'd never buy new and the Duster isn't really my kind of car. But I hope they bring over the Logan and the Sandero; nearly new these will be a bargain. Time they brought the Sandero Estate over I just love it! I have looked at the Duster entry level and its not for me, no radio, back seat no split, door handles very flymsey, no spare wheel but loads of space below floor just right for a spare wheel or make the boot much bigger, only a 5 speed box not very good for MPG. All in all I think the entry level is poor value for money, If you pay another £3000/4000 it makes a cheap car expensive. I dont think I will test drive the LHD car.